The United States became the second country to ignore the UPFA Government’s prohibition order on 16 Tamil diaspora groups and 424 of their members on grounds that they are allegedly involved in terrorist activities. Some of those listed were among those who were at the Department of State in Washington DC last Thursday. They were part of a delegation that met Nisha Desai Biswal, Assistant Secretary for South and Central Asia. It was organised by the United States Tamil Political Action Council (USTPAC). The Chatham House Rules were imposed on the meeting to encourage openness and information sharing. Under these rules, participants are free to use the information received, but neither the identity nor the affiliation of the speakers, nor that of any other participant, may be revealed. Later that day, Biswal attended a farewell reception for outgoing Sri Lanka Ambassador Jaliya Wickremasuriya. Though named High Commissioner for Canada, his agreemont has still not been cleared by the Government in Ottawa. The hour long meeting focused on a number of issues including matters arising from the last US resolution moved at the UNHRC sessions in Geneva in March. US officials including those who were in Geneva were present. Some of the participants cited Canada’s decision to suspend a voluntary contribution of US$ 20 million to the Commonwealth Secretariat while the chair is Sri Lanka and wanted to know what the US proposed to do. Canadian Foreign Minister John Baird said in Ottawa that the money would instead go to other programmes that promote Commonwealth values. Members of the Tamil Diaspora groups wanted what they called “targeted sanctions” imposed on Sri Lankan leaders and officials. They were alluding to similar sanctions imposed by the US on selected Russian officials. This came after Moscow ‘annexed’ Crimea, a part of Ukraine, as Russian territory after a ‘referendum.’ They had wanted to know what impact the outcome of the on-going Indian parliamentary elections would have on Sri Lanka. They were told to wait and see. Biswal had given a briefing to some 15 members of the delegation from six different groups on matters relating to her last visit to Sri Lanka and had expressed her disappointment over lack of progress on the part of the Government to US initiatives. All of the opposites of what the US and the World had wanted were happening, she is learnt to have said. Those remarks seem to have coincided with the Government’s own position. It was on March 21 that the Government promulgated regulations through a Gazette notification designating “groups” and “persons” who are attempting to commit or facilitate “terrorist acts.” Sixteen groups were listed together with the names of 424 persons. The order is enforced by the Chief of National Intelligence, retired Major General Kapila Hendawitharana and has frozen “funds, financial assets and economic resources” of the groups and individuals. However, it is not clear how much of such assets are available in Sri Lanka. After instances of financial remittances to individuals in Sri Lanka coming to light, a probe is now under way. Banks have been asked to provide inward remittance details of not only the prohibited organisations and persons but also others too. Most of them are to addresses in the North. The regulations in question are based on a 1968 law that has given effect to certain provisions of the Charter of the United Nations. Called the United Nations Act No 45 of 1968, it deals with the UN Charter signed in San Francisco on June 25, 1945. Article 49 relates to measures (not involving the use of armed forces) the Minister of Foreign Affairs may take through regulations to give effect to decisions of the Security Council. In this instance, it relates to “counter terrorism” measures. On April 24, this issue formed the subject of a briefing to Colombo based diplomats by External Affairs Minister, G.L. Peiris. His news release on the event said “….there is compelling evidence regarding the remittance of substantial sums of money from overseas for planned terrorist activity. As a result of extensive investigations in recent weeks, the government is aware of the sources of this funding in several instances and the bank accounts into which the money had been paid. 65 arrests have been made, and 19 persons have been released after questioning…..” At least two diplomats, whose countries are mentioned in the prohibition order, sought to obtain details and declared their own agencies would then be able to probe the matter further. However, Peiris replied that it could not be done immediately. Once the investigations were over, he said, the details would be made available them. The first to reject the move last week was Canada. Foreign Minister Baird and his deputy, Minister of State Lynne Yelich issued a joint statement in which they expressed “concern” over “the listing of 16 entities and 424 individuals for purported links to terrorist activities, including some with ties to Canada.” They said, “Sri Lanka’s action has no legal effect in Canada; it does not constrain the freedom of listed groups and individuals to lawfully express their views in Canada.” The statement noted that “diaspora communities play an important role in Sri Lanka’s post-conflict reconciliation process and the action by the Sri Lanka Government could further hinder progress on reconciliation.” It pointed out that under Canada’s Criminal Code, the Liberation Tigers of Tamil Eelam (LTTE) is on the list of terrorist entities since 2006 and said the World Tamil Movement was added to the list in 2008. Thursday’s meeting by Assistant Secretary Biswal with the Tamil Diaspora groups confirmed that the US has ignored the prohibition order too. It is perhaps due to the Government not being able to make available to Washington proof to confirm there indeed is a resurgence of terrorism. In Britain, a Foreign Office spokesperson said that it was up to the Colombo Government to make available evidence to confirm its assertions. The spokesperson held that the prohibition order “should not be used to prevent or stifle free speech and legitimate criticism.” However, India has acted on the information contained in the order. One of the 424 persons named, who was returning to India from Britain for medical treatment for his mother, was turned away. A similar course of action has also been taken by immigration officials in Teheran, Iran when one of those named visited that country. These developments come as South Africa, which has launched an initiative for “peace and reconciliation” in Sri Lanka is setting the stage for a visit to Colombo by its special envoy, Cyril Ramaphosa. The fact that the initiative has begun was exclusively revealed in the Sunday Times (Political Commentary) of April 20. One step in this direction was a briefing to Colombo-based envoys by South African High Commissioner Geoff Doidge. What Doidge claims, to use diplomatic parlance, is a terminological inexactitude or in common terms, a blatant lie. High Commissioners do lie for their country when abroad but not so outrageously. He did brief the Colombo based diplomatic community on April 17. Why then is he denying it? Whatever the reason is, Pretoria’s envoy in Colombo does not want the Sri Lankans to know that President Jacob Zuma’s Government is pursuing a reconciliation initiative in Sri Lanka. Towards this end, they do not want Sri Lankans to know even the Colombo based diplomatic community is being briefed. Is that a secret agenda of the Pretoria Government or only that of High Commissioner Doidge? One need hardly say that previous initiatives were destined to doom because of the processes lacking sufficient transparency. Here is the High Commissioner of South Africa refusing to admit that he briefed Colombo-based envoys on his country’s peace and reconciliation process. He has thus begun an exercise which would lead to suspicions and conspiracy theories. And that does not, like the South African initiative for peace, help the Sri Lanka Government. It is not only the Colombo-based envoys who took part in Doidge’s briefing. A delegation from the Tamil National Alliance (TNA) was also present. It was headed by TNA leader Rajavarothayam Sampanthan. He is now away in India for medical reasons. M.A. Sumanthiran who took part in the event told the Sunday Times, “Yes, we did take part in a briefing on South Africa’s peace initiative at a private location. Besides our leader, others who took part were Selvam Adaikalanathan, Mavai Senathirajah and myself.” He said that Sampanthan also gave a briefing on the TNA’s position vis-à-vis the South African initiative. HC Doidge, he said, answered questions raised by envoys on his country’s initiative. The Sunday Times learns when the South African initiative gets under way, Pretoria will ask both the Government and the TNA to name their principal envoys to the dialogue. According to Sumanthiran among the envoys who were present were those from the United States, France, Germany, Switzerland, India, Japan and Russia. He said that some 15 envoys took part and the event ended with a dinner hosted by Doidge. However, there were no representatives either from the UPFA Government or the main opposition United National Party (UNP). Despite Doidge’s briefing, the planned Colombo visit by special envoy Ramaphosa, billed for later this month or early June, is likely to be further delayed, according to diplomatic sources in Colombo. This is not only in view of the South African elections on May 7 and its outcome. There is speculation whether Ramaphosa would end up as a cabinet minister. Added to that are some disturbing developments in South Sudan. Ramaphosa was also named special envoy to South Sudan by President Zuma. There were fears that the newly emerged nation was sliding into genocide amidst fears of hunger and malnutrition. The unrest broke out last year after President Salva Kiir foiled a coup attempt by his Vice President Rick Machar. The unrest took an ethnic turn after Machar was sacked. Kiir’s Dinka tribe is fighting Machar’s Nuer tribe. The strife in South Sudan also saw a visit there by the UN Human Rights High Commissioner Navi Pillay. Back in Geneva now, she is reported to be busy with her officials who have returned after Easter vacation, to formulate matters relating to the international investigation into alleged war crimes in Sri Lanka. According to diplomats in Geneva, an official announcement on such an investigation is not expected until late May. This has raised concerns among some of the countries that backed the resolution that matters have not moved forward for more than a month and may extend to a further month since the Human Rights Council resolution was adopted. Yet, diplomats in Geneva say Pillay had told officials that she wants to see the investigative mechanism in place and moving before she goes on leave prior to retirement sometime in July. They say Pillay is now consulting the “OHCHR family” and has said she had twin objectives. 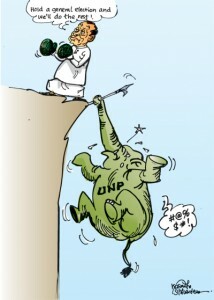 One was to have a transparent process and the other to get the Government of Sri Lanka to cooperate. However, President Rajapaksa is steadfast in his position that Sri Lanka would not extend any cooperation since it did not recognise such a process. 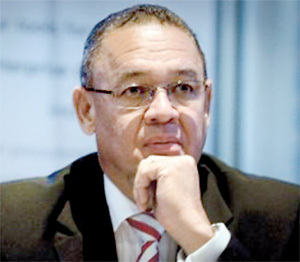 Yet, a Government dignitary was in the United States last week making informal contacts with influential personalities there including a one-time senior defence official. The Government is under pressure from some friendly quarters overseas to initiate a domestic mechanism for a probe into alleged war crimes. These quarters hold the view that the Government should not treat the UNHRC move lightly in view of the many implications it portends. In fact a subtle advertising campaign towards this had got under way. The advertisements carried the views of US senators, who had been lobbied by a public relations firm on behalf of the Sri Lanka Embassy in Washington, to move a joint resolution. In that, they called for a domestic inquiry among other matters. This has found space in full page advertisements in the media, paid for by state backed concerns. They carry the portraits of the Senators and the calls they have made. However, influential sections in the UPFA Government are opposed to the move to begin a domestic inquiry. One of them pointed out that such an initiative would only place the Government in the dock for it could be argued it had not acted earlier. Moreover, he pointed out that such a move would also cast strong doubts on the military inquiries already initiated. The Government’s official position now is that the Military Courts of Inquiry have conducted investigations into alleged war crimes. A UN official in Geneva said: “A strongly credible domestic inquiry will only help the international investigation.” The help of a friendly country has also been obtained to examine matters arising from some aspects of the US resolution. A final decision on the matter, one Government source said, would hinge on Pillay’s announcement about the international investigation. It is in this backdrop that the TNA held a two day session of its parliamentarians and local councillors at the Town Hall in Trincomalee. For more than one reason, the event was significant. The TNA has decided that it should go ahead and register itself as a political party instead of functioning officially as Ilankai Thamil Arasu Katchi or Ceylon Federal Party. The move would mean that they would speak in one voice instead of being an alliance of four different parties on Tamil issues, particularly during the South African initiative. The Alliance is now made up of the Tamil United Liberation Front (TULF), All Ceylon Tamil Congress (ACTC), the Tamil Eelam Liberation Organisation (TELO) and the Eelam People’s Revolutionary Liberation Front (EPRLF). When the TNA’s sessions in Trincomalee began on Wednesday, it was Parliamentarian Suresh Premachandran who raised issue over the TULF (led by V. Anandasangaree) not being invited. He faulted Selvam Adaikalanathan who was handling arrangements. There were mixed views, some saying Anandasangaree should have been asked to come while others argued that his party had no elected representatives. Anandasangaree had been incensed when he learnt that the sessions were being held and he was not invited. “……. in 2004, due to the interference of the LTTE, a group that do not confine to democratic norms, Tamil United Liberation Front was dropped from the TNA and in its place, without consulting anyone, the Ilankai Tamil Arasu Katchi was taken into the TNA. The TULF was the largest party of the Tamils in the North and the East and the ITAK was wound up by the founder himself, when he got elected as the President of the TULF along with the late G.G.Ponnambalam and the late Hon. S. Thondaman M.P. and leader of the Ceylon Workes Congress . The ITAK remained defunct as desired by the founder, for 26 years till some selfish persons without any regard for the founder of these two parties the late S.J.V.Chelvanayagam, revived it purely for selfish reasons. Only the four Political Parties referred to here as the founders of the alliance have every right to take any action in respect of its welfare. The ITAK dos not have any right to meddle with it. Today the name TNA is misused by interested parties for their personal gains, including collecting funds and not interested in finding solutions to our problems. At this rate we will never achieve anything. The TNA will remain as a stumbling block. The TNA’s sole purpose now is to eradicate the TULF. The letter had become public after it appeared in Tamil websites. That was to trigger some commotion at the meeting. Later, it was decided that a five member Committee should immediately take steps to register the party. They are Mavai Senathirajah (ITAK), Suresh Premachandran (EPRLF), Selvam Adaikalanathan (TELO), Dharmalingam Siththarthan (DPLF) and M.A. Sumanthiran. The Committee will discuss how the TNA would be registered as one single party and what would constitute its aims and objectives. “We had some issues. However, we have now resolved them amicably,” said Mavai Senathirajah. Contradictory and sometime controversial remarks by different members of the TNA came up for discussion. This is particularly in the light of Ananthi Shasheetharan, Northern Provincial Councillor claiming at a side event during the Human Rights Council sessions in Geneva that there was genocide in Sri Lanka. The need for moderation was stressed by Sumanthiran. On Thursday, the Alliance appointed a committee whose eight members will serve as Alliance spokespersons. They have been authorised to make statements on behalf of the Alliance. The eight are: Mavai Senadhiraja, M.A. Sumanthiran, Suresh Premachandran, Selvam Adaikalanathan, Pon. 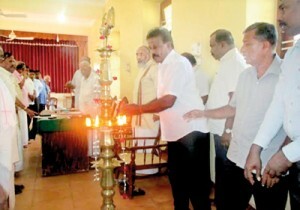 Selvarajah, D. Siddarthan, Northern Provincial Council Chief Minister C.V. Wigneswaran, and opposition leader of East Provincial Council S. Thandayuthapani. The events in South Sudan seem to be giving the Government a limited reprieve in terms of time. It is clear President Rajapaksa is biding his time until there is word on the UNHRC investigation. The South African peace and reconciliation initiative, which its High Commissioner in Colombo wants to keep a “top secret,” will no doubt play out concurrently. That would give Rajapaksa some relief that a main issue in the US resolution is now being addressed. However, the woes arising from them are far from over. The conduct of the country’s foreign policy remains in shambles, and it will not be an easy task. Not even when some of the friendly countries who have cautioned Sri Lanka are willing to help. Allowing time to pass with little or no action has cost the Government heavily. Hence, damage control will no doubt have its limitations now.